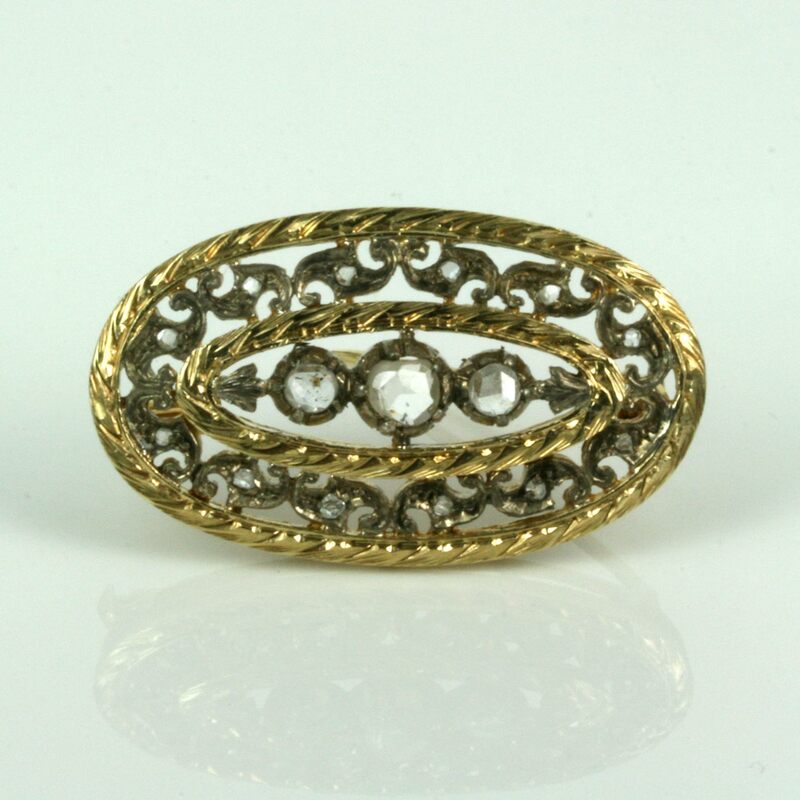 Product code: 2289 Categories: Antique, Sold Jewellery. Here is a truly stunning antique brooch set with a total of 15 rose cut diamonds in the most stunningly hand crafted design that is simply breathtaking and a true testament to what high quality jewellery could be made well over 150 years ago. Dating from the 1860’s, this magnificent rose cut diamond brooch measures 35.5mm across by 20.8mm wide and was all hand made in 18ct yellow gold and silver. Today diamonds are often set in white gold or platinum, however white gold was not invented until the early 1900’s and platinum, although discovered before this time was not used in jewellery until around 1910 so silver was used to maintain the “white” in the diamonds to prevent them from being tinted yellow from the yellow gold. Rose cut diamonds are such a wonderful cut of diamond and is where they have a flat base and pointed top and are prized by antique collectors and dealers alike. The 15 rose cut diamonds have a total weight of 0.34 carats and are not simply the three main rose cut diamonds in the centre but also set all around in that highly intricate scroll work. The amount of time needed to hand make this diamond brooch would of been immense and this diamond brooch look so good on any outfit not just because of the diamonds, but also because of the wonderful openwork allowing so much natural light to enter the diamonds and what ever colour of outfit that it is being worn on to truly make this brooch stand out more.